Most men would do anything to get out of Fox River Penitentiary, but Michael Scofield (Wentworth Miller) will do anything to get in. His brother Lincoln (Dominic Purcell) has been sentenced to die for a crime he did not commit, and the only way to save him is from the inside out. Armed with prison blueprints and an impossibly intricate escape plan, Michael gets himself incarcerated, and the race against time is on. Now, he'll need all o.. Breaking out was just the beginning. Over the wall and on the run, the most-wanted men in America, Michael Scofield (Wentworth Miller) and his brother Lincoln Burrows (Dominic Purcell), must lead a dangerous band of hardened fugitives on a desperate international flight, chasing millions of dollars, risking everything to expose a sinister government conspiracy, and fighting desperately to stay alive until the day they can stop running. .. Breaking out of maximum security at Fox River was the easy part. Now, Michael Scofield (Wentworth Miller) must fight to survive inside Sona, a hellish Panamanian prison where the only rule is brutal violence and the only way out is in a body bag. So, with time running out, Lincoln Burrows (Dominic Purcell) scrambles desperately to free his brother along with the only man who can deliver Lincoln's captive son from the sinister clutches o..
Go deep inside this spectacular final season of Prison Break with revealing special features, including an exclusive extended cut of one of the most thrilling episodes! 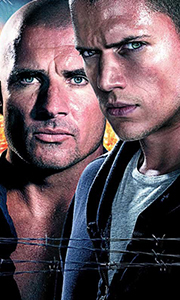 In order to destroy the sinister organisation known as the Company, Michael Scofield (Wentworth Miller) and his brother Lincoln ( Dominic Purcell) must elude a murderous assassin and uncover the deadly secret behind the mysterious Scylla device. Lives are shattered and t..
Prison Break returns as a special event series with its most adrenaline-fuelled storyline ever! Although he was buried seven years ago, pictures from a Yemen prison reveal that Michael Scofield (Wentworth Miller) may still be alive, which sends shock waves through everyone he knows. Determined to rescue his brother, Lincoln (Dominic Purcell) enlists C-Note’s (Rockmond Dunbar) help. Meanwhile, Michael’s wife Sara (Sarah Wayne Callies) ha..
Now you can own one of television's most exhilarating series ever! Michael Scofield's (Wentworth Miller) attempt to save his brother (Dominic Purcell) from a wrongful death sentence takes him from escaping a maximum-security prison, to a nationwide manhunt, to a nightmarish Panamanian prison, and to the discovery of a sinister government organisation. Finally, in the Middle East, a whole new escape plan must be executed. Capture all fiv..
Own Prison Break Season 1 - Part 1 DVD from Deff, DVD, Blu-Ray & 4K Video Specialists - Free UK Delivery..
Own Prison Break Season 5 Blu-Ray from Deff, DVD, Blu-Ray & 4K Video Specialists - Free UK Delivery..